HI Vancouver Central i Vancouver, Kanada : Boka nu! CANCELLATIONS AND CHANGES: Cancellations received at least 30 days prior to the group arrival will qualify for a full refund. Cancellations received less than 30 days prior to the group arrival are sujbect to a charge equal to the first night&#39;s stay. The client must reconfirm their numbers 48 hours prior to arrival. Changes of up to a 10% decrease in the original group size can be made without penalty providing that HI is notified at least 48 hours prior to group arrival. Any request to increase the group size will be accommodated subject to availability. Cancellations made within 48 hours of arrival will result in the client being charged for the full stay. Client no shows will be paid in full. DEPOSIT: Group bookings will be secured with a credit card or the first night accommodation paid within 7 days of booking. The client must prepay reservations in full, 30 days prior to the group arrival at the hostel. Payments by Visa, MasterCard, bank transfer or cheque (CAD) are welcome. GROUP ACCOMMODATION AGREEMENT: The group leader must sign a Group Accommodation Agreement, prepared by Hostelling International, to confirm reservation details. This document is required at time of booking. GROUP ROOMING LIST: A rooming list is required two weeks prior to arrival. List should specify first and last names, gender and any specific rooming requests. We are unable to accommodate groups of children under the age of 18 at our location. Free all-you-can-eat breakfast! Bagels and cream cheese, cereals, muffins, scones, toast, fruit, juice, milk, tea and coffee, served every day from 8 - 10am. It's at least a $5 value, and we know you've got better places to spend that money - like on beer! Free Wireless throughout the hostel! Private bathrooms! Every bathroom in our hostel is a private bathroom. ** Please note, taxes not included. 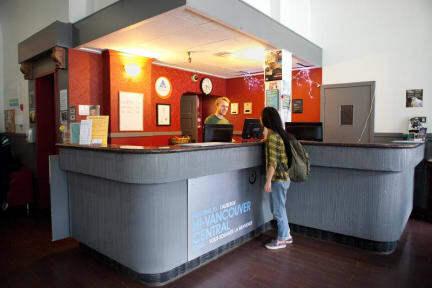 Smack dab in the middle of Granville Street's pub and club district, we're one of the newest Vancouver hostels -- and if you're angling for access to all the partying and good times you could want, without compromising on security, comfort, and cleanliness, then we're where you want to be! Our in-the-thick-of-it location makes for the perfect home base while you explore Vancouver. Our hostel has awesome daily tours that'll have you hanging out with travellers from all over the world while you teeter across the Capilano Suspension Bridge or sip a pint on one of our pub crawls. If you're looking for the fun of a hostel, but still want privacy, you'll love our ensuite private rooms and our two-bed dorms. These are our most popular room types, so make sure to book in advance! A quick word about our kitchen -- our previous guests have asked (and we listened!) that we mention ahead that our cooking facilities include only microwaves, toasters and kettles. If you're looking to cook up a feast, we've got two other hostels in Vancouver (Downtown and Jericho Beach) with really impressive kitchens. We know you care about security, too, and that's why you'll find your own backpack-sized locker in your dorm. When you don't have to worry about your stuff, you can really start enjoying yourself. So that's our story: fun, secure, comfortable, clean, and can we just put in one more plug for the Granville Street nightlife? HI Vancouver Central is part of HI Canada, a not-for-profit organisation on a mission to build a community of conscious travellers who share a greater understanding of people, places and cultures. Good location, right on Granville street. Bathrooms always clean. Rooms were nice with comfortable beds. If you have a room facing Granville street it can be a bit noisy during the evening, especially during the weekend. I didn't think it was that big of a problem though. Great breakfast with bagels, cereals, muffins, fruit and juice. You got more than expected from a free breakfast. Much appreciated.